Cradle Size 21.5" x 8"
Ergonomic Design This professional veterinarian scale was specially designed to deliver reliable results time after time. Thanks to this scale's easy to use three button design and large weighing tray, anyone can accurately weigh pets with great precision. RS232 Serial Port This digital animal scale has an integrated RS232 serial port to eliminate the need for manual data entries by allowing you to effortlessly send your data to a computer. This can save you a great deal of time and energy, not to mention reducing errors in recording. Rechargeable Battery Get weights where you need them with this digital scale. The included rechargeable batteries allow you to weigh pretty much anywhere you need to without having to search for a wall outlet. You can also use the included AC adapter to power your scale. Easy To Read Display You won't have a problem seeing your weight readings on this vet scale. The Seca 727 will display your weight readings in bright, red, LED digits. Tare Feature The tare button on this animal scale can be pressed to "zero set" the weight on the scale. You can then add more weight, and the display will only show the weight of what you're adding. This can come in handy for accurately measuring your pet's weight even with a blanket or weighing pad on the scale. Hold Feature You can even get accurate weights of wiggly critters thanks to the hold feature. Use this scale's hold feature to freeze stable weight readings on the display. Once the hold feature is activated, the weight on the display won't change until you're ready to weigh again. 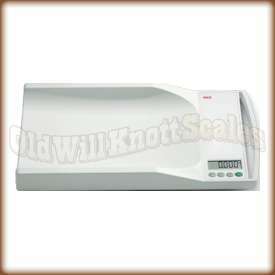 2 YEAR MANUFACTURER'S WARRANTY Seca Scales offers a two year warranty against defects in materials and workmanship. In the rare case ya have a problem with this scale, contact Seca for a repair or replacement scale.